Class Charts allows you to send out login details to your staff in bulk. To do this, click on the three lines menu in the top right hand corner of the page and select Teachers from the list of available options. You will be presented with a list of users that have previously been added to Class Charts. Before you send the Class Charts account details out to staff, please take the time to ensure that each email address listed is up to date and correct. To begin sending out Class Charts login details, click on the Send account details button in the top right hand corner above the list. All teachers: This will send out an email to all members of staff that have their email address on Class Charts. 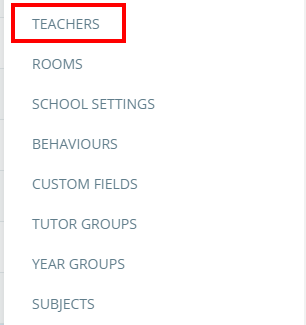 Selected teachers: This will send out an email to members of staff that you have previously selected, by clicking on their row in the teacher menu. Teachers who have not yet accessed their accounts: This will send out an email to members of staff who have not logged into Class Charts before. You can check which members of staff have logged into Class Charts by confirming if there is a tick next to their name in the Teachers menu.